Benoît Mandelbrot. Scribbled arrows showing the technique of magnifications of details. Computer-generated prints with scribbles. Collection Aliette Mandelbrot. 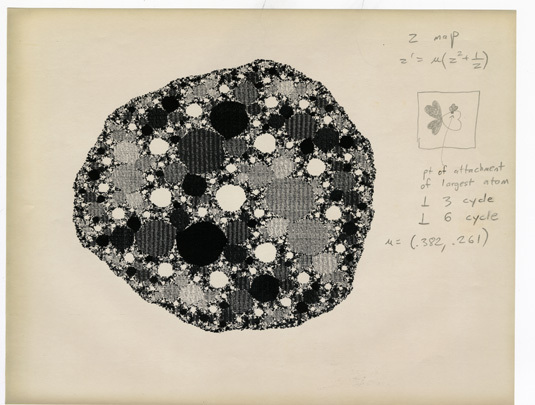 Focusing primarily on the work of Benoît Mandelbrot (1924–2010), one of the most notable mathematicians of the twentieth century, this exhibition explores the role of images in scientific thinking. With their capacity to generate and shape knowledge, images are at the very core of scientific investigation: charts, graphs, notebooks, instrument readings, technological representations, even mental abstractions–all make up the essential stuff of which ideas are made. Featuring works on paper, photographs, objects, and films, the exhibition gives viewers a chance to take an inside look at the role images played in the making of the new world of scientific thought that became popularly known as fractal geometry and chaos theory, as exemplified in Benoît Mandelbrot’s Fractal Geometry of Nature (1982). The Islands of Benoît Mandelbrot is accompanied by a catalogue published by Yale University Press. This exhibition has been organized by the Bard Graduate Center: Decorative Arts, Design History, Material Culture, New York, and curated by Nina Samuel.